My sister has a 15 year old son who is practically eating her out of house and home! One day we were grocery shopping and we passed by the packaged Ramen noodle soup and she said that he loves this stuff, but she refuses to buy it for him because it's not very healthy...and I agree. Well...D, I have a solution for you...something that Jonathan can make in 10 minutes or less when he comes home from school starving! And it's incredibly healthy too! You can make Ramen with just three ingredients: water, light miso paste and noodles, but I hope that you'll experiment and add whatever healthy veggies you like and create a delicious and nutritious soup in minutes! Traditional Ramen soup starts with a stock that is slow cooked for many hours to obtain the right depth of flavor and also uses noodles that are handmade. Most of us don't have the time to create stocks or noodles from scratch so we end up purchasing the canned or packaged version. I make my stock/dashi with dried kombu/seaweed and dried shiitiki mushrooms, but you can use just water and miso for the base and it will taste just as delicious. For the noodles, I use a product called Green Noodle the plain/vegan version, but you can use whatever egg-free noodles you like. If making kombu dashi from scratch, soak kombu in filtered water for at least 30 minutes. Add dried mushrooms and heat on high until water starts to boil then remove from heat, cover and let steep for 30 minutes. Strain liquid and return to sauce pan. Add dried porcini or shiitake mushroom powder, soy sauce and bring back to a full simmer. 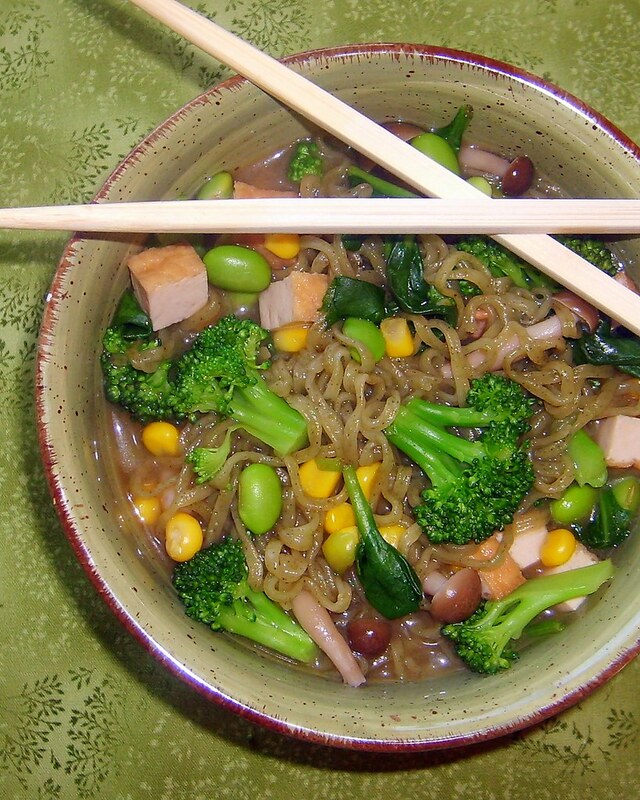 Add tofu, enoki mushrooms, edamame, corn and noodles and cook for about two-three minutes or until noodles are ready. Just before serving whisk in miso paste and add broccoli and baby spinach. Garnish with chili pepper and serve piping hot.